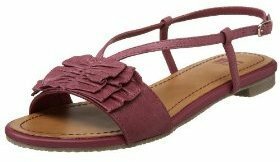 These BC Footwear 'Old Money' Ruffled Flat Sandals are available in four colors and range in price from $29.90 to $44.96 at Endless.com. While I think either option is a good buy, you can save a couple dollars with these Xhilaration 'Tabby' Bow Flat Sandals, just $17.99 at Target.com and Target stores. Click any image for shopping details! Just bought the Target ones this weekend and I can't wait to wear them once the weather improves a bit---so summery and bright! Wow, look at the resemblance. This is such a cute pair, I could always use more pairs of summer sandals.